Since I brought 2 colleagues who hardly went travelling, I had a mission to give them a lasting memory of their stay in Ho Chi Minh. Aware of their reluctance to settle with backpackers hostel, I booked Hong Thien Loc Hotel having its address at 287 – 289 Pham Ngu Lao Street, District 1 via Agoda and paid for the room charges for 3nights at USD137 in advance. Hong Thien Loc Hotel at Pham Ngu Lao Street should not be confused with Hong Thien Loc 2 Hotel near Ben Thanh Market. I booked one room for 2 adults with an intention to add an extra bed on arrival. Nothing was mentioned in the website that you cannot add on a bed. When we arrived late that night, we were subjected to little hospitality by the hotel staff. We requested for a bed to be added on to our room and the hotel staff rudely refused. The hotel staff insisted us to add USD15 per night for the third person. In Malaysia, if you book a room, then it’s up to you how you are going to use the room subject that only 2 person will be allowed to go for breakfast. This concept is never to happen in Ho Chi Minh, atleast in Hong Thien Loc Hotel, Pham Ngu Lao Street! The hotel staff did not even have a courtesy to smile at hotel patrons, let alone be polite! At 11p.m. Saigon time, he literally chased the third person which was obviously yours truly since the other two were inseparable. He shouted across the counter as if we had no money to pay for the room when in fact I had paid for the room one month in advance. At the counter, there were other patrons, at least 5 others. So, it was yours truly with a thick face fighting for her rights to stay in the hotel. So much of hotel hospitality, I decided to have a look at the room. I told the hotel staff I’d send my friends up and leave the hotel soon. Too my surprise, the hotel room was nowhere near to the room showcased in Agoda website. The room was small and stuffy. And for the USD45 per night, it was not worth every penny. However, there was ample space for a bed to be added in. I was eager to leave the hotel, but it would not be wise to leave as I had already paid RM400+ for 3 nights stay. So we had to bear with the hotel with attitude problem for 3 nights. In attempt to let not the hotel ruin our vacation, we came down and told the guy the let me stay one night for free at the room with my colleagues and we would pay for extra costs for the remaining 2 days with a view that we would be given a room for 3 persons. He then told us we had to pay extra USD10 (without breakfast) to allow the third person to remain at the SAME ROOM for they will not be giving us another room for 3 person throughout our stay. At all material time, I wanted to call Agoda HQ Office at Bangkok, but I could not place a call from my Malaysian number. We settled that night with having to pay unnecessary USD10. So we stayed at the hotel for 3 nights and paid USD30 extra. I wanted to find a backpackers lodge for myself but my colleagues did not allow me for they were not confident with staying on their own. We succumbed to our faith in Hong Thien Loc Hotel by paying more money than necessary. But I made a vow that night to write a review on how inhumane we had been treated that night. The male receptionist did not even once smile to us during our stay. When Kak Ju asked him, if he knows how to smile, he pouted and made his face uglier. Kak Ju even made facial expressing showing him steps to smile, he still gave us the ugly face. He shouted at other staff right in front of patrons’ face. He also wanted to keep our passports throughout our stay to which I engaged into another row with him. I was in Vietnam two months ago, Hue specifically. I had a similar room (in terms of size) in Hue at the costs of USD5 a night. Things are so much different in Saigon where most people I met were rude. Some of the description on the Agoda site about this hotel is misleading. 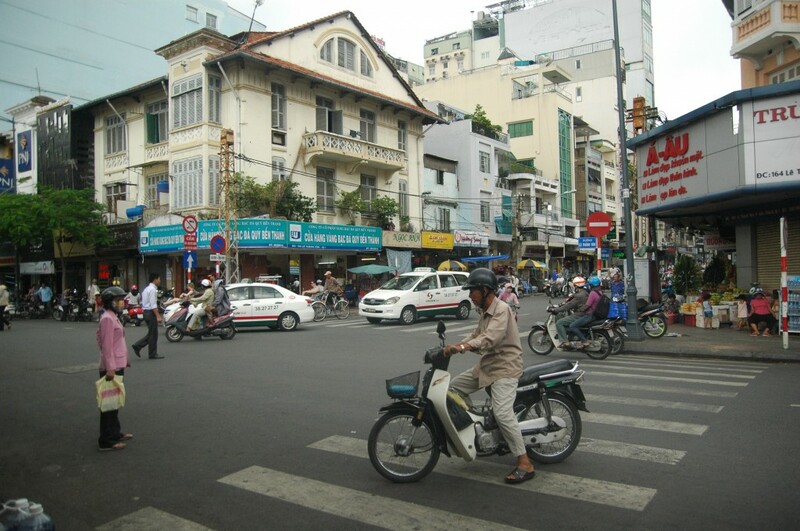 For example, it is 15 minutes walk to Ben Thanh Market – not just a few minutes’ walk! SO, AVOID STAYING AT HONG THIEN LOC HOTEL, PHAM NGU LAO STREET AT ALL COSTS. Saya suggest bawa plug adapter sebab plug untuk camera dan handset tak sama dengan Malaysia. Kalau sama pun plug two round pins sebab boleh pakai kat sana. Kalau 3 pins plug tu memang x leh pakai.